All health and care professionals share a common commitment to do their best for the public we serve. And increasingly, practising effective prevention is recognised as a vital part of this, helping more people live longer, healthier lives. Earlier this year we carried out research into what the public expect when it comes to advice on preventing ill-health. This confirmed that while they may not always ask for it, people expect to be offered support on a range of different issues and are open-minded about where this comes from. We have a shared responsibility for prevention and all health and care professionals have a role to play. Preventing ill-health and promoting wellbeing isn’t something that is confined to public health professionals – any professional can offer brief advice in the knowledge that, in most cases, the public expect and trust this advice. Time is often limited in most contexts. So it’s important that all professionals have easy access to the information and evidence they need to make the most difference, particularly when it comes to dealing with the most pressing challenges facing public health. Developed by PHE experts, it supports prevention priorities, including those detailed within the NHS Long Term Plan to help reduce health inequalities and premature morbidity and mortality. Recently we have been working on a new way for professionals to engage with All Our Health to make it quicker and easier for people to benefit from the evidence and information it offers. 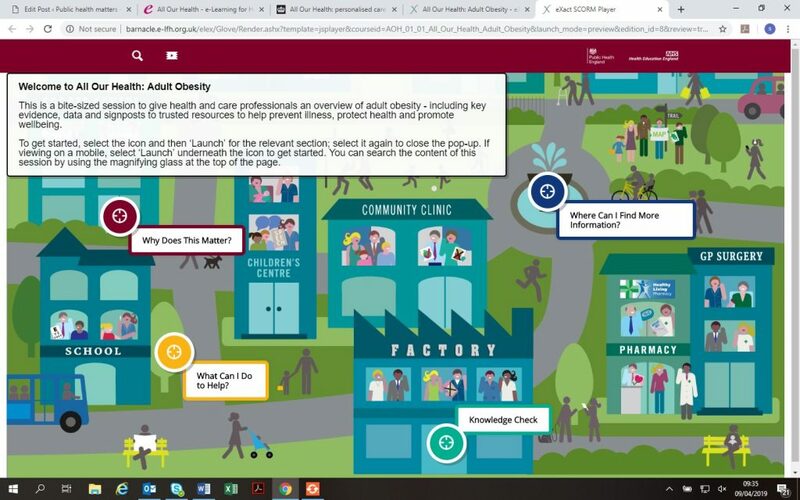 Working with Health Education England, we have developed a series of e-learning sessions providing a bite-sized introduction to different public health topics, with signposts to trusted sources of evidence, guidance and support. The first e-learning sessions are available now and cover cardiovascular disease prevention, adult obesity, antimicrobial resistance, physical activity, social prescribing, giving children the best start in life and supporting those at risk of, or experiencing, homelessness. There will be 15 more sessions published over the coming year for topics ranging from smoking cessation to health at work. Each session introduces a different topic, setting out why it is a public health priority and what professionals can do to address it, with short knowledge tests to enhance learning and signposts to further information. The sessions are designed to be used flexibly, making it easier for people to get advice that will help them make a difference to their practice alongside the busy demands of their day-to-day roles. Each is underpinned by the latest evidence and designed to build on professionals’ existing knowledge. There is advice for how professionals can find out the scale of issues locally and tools to help them measure and evaluate the impact of their work. There is also guidance on how specific topics can be addressed through conversations with patients and every day interactions. 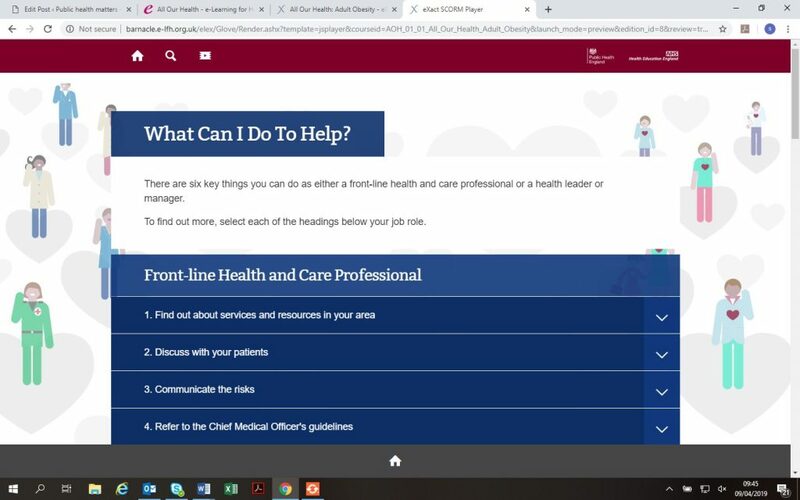 This information is relevant to people working across the health and care sector, from frontline practitioners to managers and strategic leaders. Completing the sessions can also count towards continuing professional development. These new e-learning tools are a quick and simple way for professionals to recap and build on their knowledge about priority public health issues and find out about how they might embed prevention into their practice. Using them will help existing and aspiring health professionals better understand the transformative impact that prevention can have and how they can do even more to prevent illness, protect health and promote wellbeing. Imagine the potential of over more than 2 million health and care professionals committing to focus more on our top public health issues of today. This would lead to more people living longer and healthier lives, which was one of the main reasons why I wanted to become a health professional in the first case.